Boasting a miniature design perfect for children, the Tangle Cherub Hair Brush boasts a height of 15cm and specialised antibacterial additives embedded in the plastic which works to keep hair fresh and hygienic. Suitable for all hair types, this cute brush features anti-static properties and sturdy bristles which retain their shape and height. Perfect for de-tangling and keeping frizz at bay! K.D. The comb is very good that can help massage my head. Of course, it works well to make my hair be tidy! For a free shipping arrangement from UK to HK, only 14 calendar days is required! Packing is really nice as well. Product comment is just the same as the Review Title. Thank you so much! A high effective way of logistics service. I got the Goods in my office after 11 days I created the order in Changchun China. May the logistica always be effective. Great brush. No matter the hair is wet or day, it can brush smoothly. As my hair is not too much, Kids size is suitable for me. 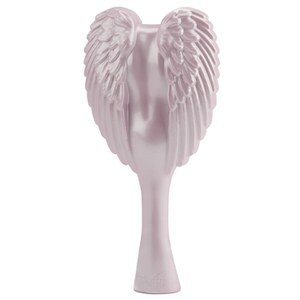 the tangle cherub hair brush is very excellent! I got this for my daughter and she loves it :) the size is perfect for little girls, the design is lovey and it brushes the hair without causing any pain. Hair brush is the best. daughter does not cry! This is my first experience of buying things on HQ. the brush is of great quality. I bought this for my nephew and she love it very much. Also free delivery is attractive.